The BC Community Living Action Group (BC-CLAG) is a network of self-advocates, families, support staff and agencies who support adults with disabilities. For the past 18 months, we have been advocating on behalf of adults with disabilities and those who support them, and helped raise broad awareness and understanding of the importance of community living. We have identified key challenges and develop consensus‐based recommendations to restore confidence in BC’s community living system. 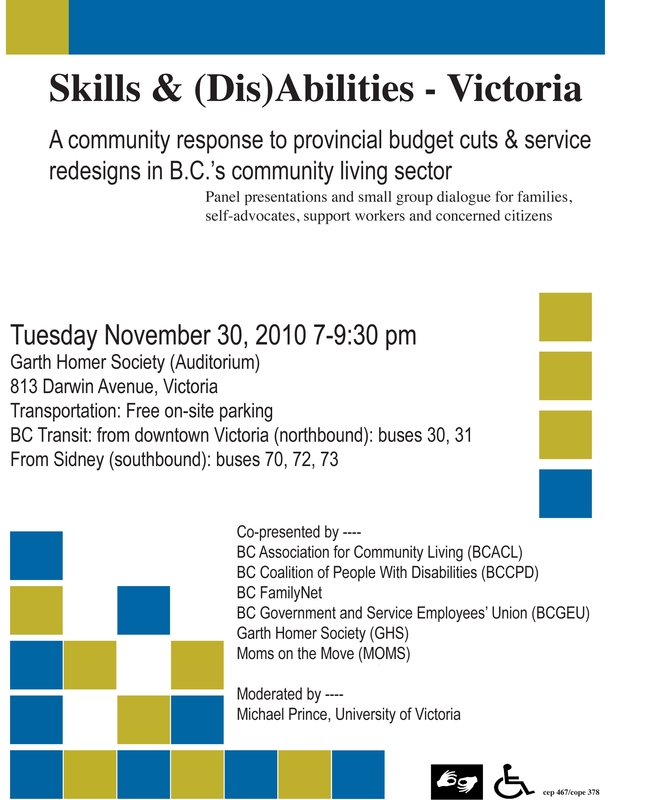 a stop to government cuts to supports and services affecting adults with developmental disabilities. an independent public review of BC’s community living sector, examining capacity, funding, and oversight. the release of CLBC’s strategic and operational plans and budgets, as well as the disclosure of expected plan outcomes. an independent officer of the legislature to advocate on behalf of persons with disabilities who are receiving or seeking provincial government support. new legislation that guarantees the provision of publicly funded services and supports to people with developmental disabilities, sufficient to meet their diverse and changing needs. BC-CLAG meets regularly to exchange information, ideas, and collaborate on various actions, including: public meetings, undertaking advocacy, issuing media releases, and holding news conferences. Through our efforts, numerous families, self-advocates, and support workers came forward to share their stories, resulting in over 350 media stories to date. 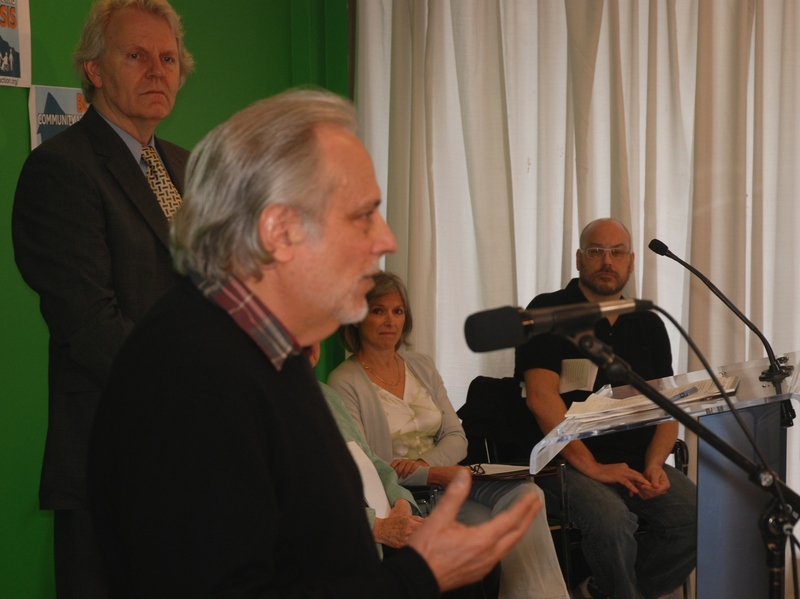 BC‐CLAG’s unprecedented community partnership represents a unique and invaluable opportunity to harness community resources and leadership to advance the positive change we all know is needed and long overdue in the community living sector. BC-CLAG members represent various constituencies, and have both aligned and divergent interests, positions, and priorities. 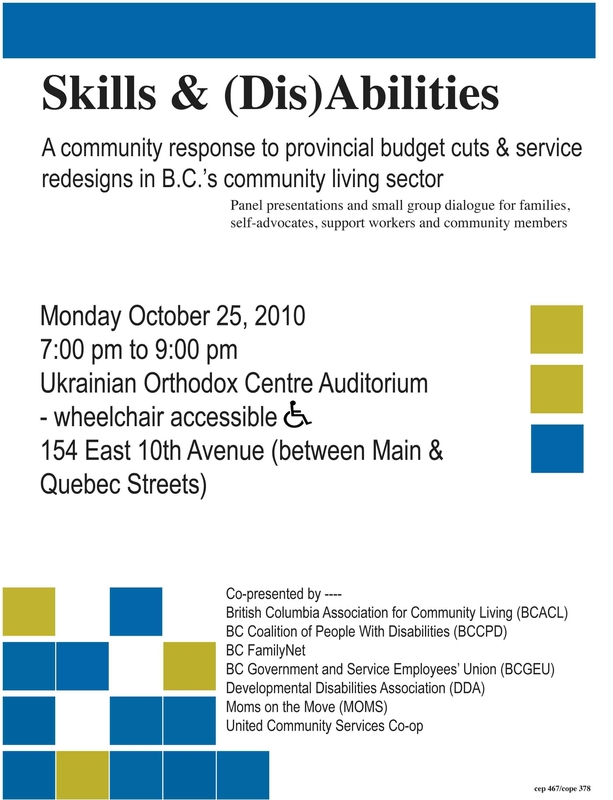 A network of family groups, advocacy organizations, unions, and service agencies—now operating under the name BC-Community Living Action Group (BC-CLAG) began meeting together in the fall of 2010 to share information about the crisis in BC’s community living sector. Their first order of business was to coordinate a series of public meetings in Vancouver and Victoria to expose the issue and explore solutions. In total, 330 people participated in the two meetings, including self-advocates, family members, front-line support workers, and other concerned citizens. Meetings featured brief panel presentations followed by a small group dialogue session focused on the question: What can we do to ensure that adults with developmental disabilities have the options, services, and supports that they need? Group members shared personal experiences, listened to each other’s views and concerns, and brainstormed solutions. Increase provincial government funding to meet the support needs of adults with developmental disabilities, and allocate funding equitably and strategically. Create an independent advocate with a broad legislated mandate to improve supports and outcomes for adults with developmental disabilities. Raise public awareness through education, community outreach, and political advocacy. Listen to individuals and families by re-centring the community living support system around adults with developmental disabilities and their families to ensure choice and inclusion. Consult and collaborate with service agencies, front-line workers, disability advocates, and other stakeholders with key knowledge and expertise. Introduce provincial legislation setting out the inclusion rights and support entitlements of adults with developmental disabilities. Improve transparency and accountability in the sector and implement measures to ensure the government’s community living infrastructure is held to account. Develop and implement a multi-year provincial community living plan, in consultation with key stakeholders, for eliminating waitlists, transitioning youth to adult services, meeting rising demand for supports, and other priorities. Regulate home sharing through a provincial framework that addresses service standards, training, and oversight. Protect group homes by stopping cost-driven closures and service reductions. BC Family Net President Anita Dadson, one of the parents who pioneered BC’s community living movement, speaks in April 2011 at the launch of the BC-CLAG report recommending sweeping changes to address the growing crisis in BC’s community living sector.